The death of a man who was found dead in a burned-out car is being treated as murder, according to police. Polish national Rafal Michal Lyko, 36, was found in a stolen Mercedes GLE in Blantyre, South Lanarkshire last week when the fire was extinguished. 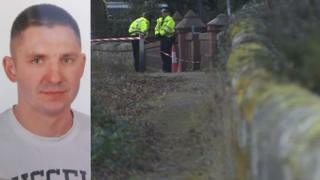 Police said he lived in Poland and was visiting relatives in the Tayside area. The car was stolen in January, and police believe it was in East Kilbride and Cambuslang before being found alight in Blantyre's Greenhall Park. Police were called to the scene at 19:55 on Monday 11 February, and are trying to piece together Mr Lyko's last known movements. Det Ch Insp Davie Scott, of Police Scotland, said Mr Lyko arrived in Scotland from Poland on Saturday 9 February. He went to Tayside from the airport, and police are trying to work out where he went next. He said: "We still need to piece together Rafal's last known movements. "He arrived at Edinburgh Airport on Saturday 9 February from his home in Poland. From there he travelled to the Tayside area to visit relatives. "Officers are working hard to gather as much information on Rafal's death and work out where he then travelled to after that. We are keen to speak to anyone who has any knowledge of Rafal's movements after Saturday 9 February." Previously, police have confirmed that he travelled to South Lanarkshire on Monday 11 February. They believe that both the stolen car and Mr Lyko, who has a partner and young son in Poland, were in the Blairbeth area of Rutherglen shortly before they were found in Greenhall Park. The black Mercedes GLE was stolen from the Oxgangs Road area of Edinburgh on 24 January and was in the Morningside area for several days.